What i want to share today is a simple bracelet with cute acrylic beads. Nuggets imitation gemstone acrylic beads and gold chains compose the major of this bracelet. Simple but special. If you have a free weekends and have no plans to do, this maybe a good plan you can have a try. This jewelry tutorial will divide into two main parts. One part is about the materials and tools you will need in this jewelry making. And the second part is about the instructions of jewelry tutorial. 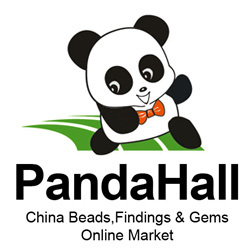 Take out one flat round imitation gemstone acrylic bead, chocolate; two nuggets acrylic beads, mixed colors; two iron eye pins. Thread the beads one by one. Make the small two acrylic beads threaded on one eye pin. And bend the top wire of the eye pins. Add the beads together and put on four stainless steel chains in the two sides of the beads. Finally, add the jump rings and lobster claw clasps. Here is the final look of the bracelet. Do you get it? Summary: Wearing magnetic earrings you needn’t experience the pains from pierced ears. Our tutorial is to inform you practical tips about how to make magnetic earrings look real. You want to pierce ears for jewelry wearing? Yes, most of you are eager to wear earrings to adorn yourself and show off the beauty, but the pain of piercing is a huge obstacle which gets you cringed! Maybe you are too young or too old to be allowed to get ears pierced. So magnetic earrings are a better choice, and this tutorial is to tell you how to make magnetic earrings look real ones. Do not attach heavy and long dangles to your magnetic earrings, and stop others or yourself from touching or pulling them, otherwise they will move, cause pain feelings and even fall. Magnetic earring settings studs have the plain flat round backs that are easily detected by some sharp eyes; so you’d better tear some backs from real earrings and snuggly glue them onto your magnetic ones, which can to a great extent deceive the public and no not need earring hooks. If your hair’s long enough, use it to naturally cover the magnetic backs, or wear a hood when wearing them; moreover you must fix the places where you wear them, or people will notice they are fake as every time your earrings are in different places. Some certain cultures, religions or medical ailments, however, may prohibit an individual from piercing ears. Because of individuals, you will discover choices to pierced ears including clip-on earrings, ear cuffs and magnetic jewelry. After referring to Beebeecraft how to make magnetic earrings real tutorial, you will wear them in a very fine way. Summary: This is a basic jewelry design. It will mainly show you how to create your own charm bracelet using edible candy and jewelry making chain. Super easy and amusing! If you love eating Lucky Charms cereal, perhaps you’d also love to wear them. The brightly colored candies actually look adorable as charms for special themed jewelry designs, such as a New Year necklace, Christmas bracelet, etc. Here, in this post, I will show you how to create your own charm bracelet for a fantastic candy party. Step 1: pick out the candy pieces you prefer, all sorts of shape and color. Step 2: cut segments of 3cm-long jewelry wire. Curve each wire into horseshoe shape around round nose pliers. Then insert the wire into each candy as the picture shows. Step3: after making 12 or so candy charms, take a piece of waxed paper and then lay out all the charms on the paper and on a small plate. Slightly paint a thin layer of Mod Podge on top of each candy. Wait for it to dry completely. Step 4: take the prepared chain strand and hang the candy charms using jumprings on it. Soon you’ll have your creative charm bracelet finished! However, if you want to simplify the jewelry designs on how to create your own charm bracelet, try using the pre-made charms out of glass or clay. I recommend you try it out my way. It’s so much more fun and amusing to make it this way! What do you think?? Summary: In this post, we will show you a way to make inexpensive jewelry-a recycled braided bracelet. Simply collect your old t-shirts and chains from broken accessories and then we’ll start! LuShae once said that jewelry has existed throughout human history as an integral form of expression, wealth and social status. And up to this present day, this statement still remains true. However, jewelry is not only made out of previous gems or noble metals. It can also be made out of inexpensive jewelry craft materials used in everyday life including T-shirts, pants and even handbags. So, I reproduced this post about upcycling a braided bracelet from a very kind Hanna. Step 1: cut 5 pieces of fabric into strips, 3 about 2~3cm wide and 30cm long and the rest 2 with same width but just 10cm long. Step 2: take one of the shorter strands and place it on a flat horizontal surface. Heat the glue gun glue a few drops onto the fabric. Twist the starting ends of the 3 longer strips and lay them on the glue, as pictured show. Step 3: pick a chain strand and fold it in half. Glue it onto the shorter fabric strip using glue. Step 4: add a few more glue drop and then roll the shorter fabric strip over itself covering everything in it. Wait for it to dry completely. Step 5: start the braid with the 3 fabric strips and the chains. Make sure the chains are visible. Step 6: glue the end of the bracelet just like the beginning. Step 7: attach a ribbon end on both ends. Finally, add the toggle and a t-bar using jumprings. Although this design is makes a fairly inexpensive jewelry, the results are amazing and a great way to recycle an old t-shits and some old chains. Such types of braided bracelets have been popping up all over the web so it’s a great opportunity to share it here with you! Summary: This is a very easy but creative jewelry making tutorial that shows a distinctive method to make leather necklaces for women. For those who love custom and modern jewelry accessories, read on. Use old hardware such as hex nuts to make jewelry that allows you to “go green” and create a large number of one-of-a-kind jewelry sets at the same time. However, some skin types may be allergic to these metal jewelry craft supplies, especially with all the summer heat and sun. Hence, the hexagon leather necklace for women solves all of these problems. It’s made of faux leather fabric and chain and you will love this jewelry making project, I promise! How to start the faux-leather necklaces for women? After that, place the leather pieces on fabric. Glue the backsides of the leather pieces and fabric together. Cut another 6 hexagons out of fabric. Make sure the edges are well glued together. Punch two little holes on each hexagon to allow the jumprings to pass through. And it is ready to wear now! The above instructions are all you need to know for today’s jewelry making tutorial. If you are a person who addicted to cool designs for leather necklaces for women, please just feel free to contact me! Nice day. This pair of earrings is made by royal blue glass beads, faceted and golden chains. It is easy to make it. And you can learn handmade crafts by this. Thread six glass beads on head pins. And cut down the rest wire if the head pins are too long. Then bend the head pins into circles. Put all glass beads threaded on a jump ring. Make the jump ring connect with the earring chains and add the other earring components. Make another earring in the same way. This is the final look of the crystal drop earrings. Have you got it? See you next tutorial. Summary: This is a really simple but amusing funky jewelry design and it doesn’t include any skillful techniques so that even beginners can learn how to make a bracelet with great ease. It’s a funky jewelry design from happyhourprojects and the original author calls it a fish beaded bracelet. But actually it is a multi-strand beaded hemp bracelet accented with a large metal fish bead. When I first saw this design, I knew I wanted to make one because I was deeply attracted to it! Want to have a look? Just keep reading and learn how to make a bracelet with us. How to make a bracelet? Cut strands of hemp fit for your wrist size. Slide on the seed beads one after another. When you need to separate the beads on the string, tie a knot. For the focal fish bead strand, attach the fish bead with a knot as well. Once you have all beaded strands finished, align them. Take a cord end cap and insert the cord ends in it. Secure with drops of super jewelry glue. Wait for it to dry completely. Arrange the hemp strands in the pattern you want them to be. Cut the other end evenly and glue on another cord end. Attach the lobster claw and one jumpring at the ends. You have finished this funky jewelry bracelet tutorial! All beads and assistive tools are available in craft stores. Additionally, I wanted to show this tutorial here so that all levels of crafters can learn how to make a bracelet in an extremely simple way. Hope you will love it!